Welcome to our Jewelry showroom. All pieces on this page are handcrafted. For most projects, we use an artificial sinew, which is a waxed nylon, for added strength and durability. For our finer pieces, a high quality bead thread that we coat with beeswax is used. We incorporate only beads of natural materials, no plastics are ever used in our work. We hope you find the piece that suits you! CHOKERS: Our chokers are of both traditional and non-traditional in design, to meet your likings. Most are made with hairpipe, glass and metal beads. They are strung with artificial sinew to ensure strength. The tie strings are of suede leather or buckskin lacing. 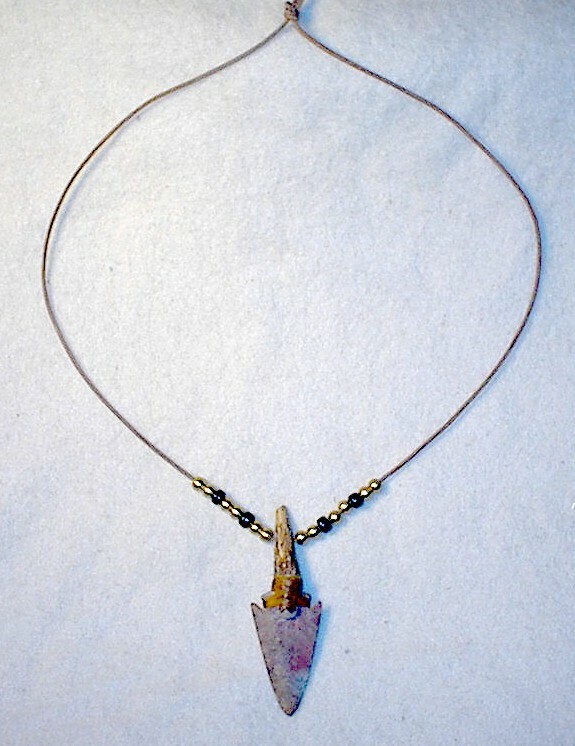 This necklace includes a pendant that consists of an arrowhead point that is knapped from Flint Ridge, hafted to a white tail deer antler tip with artificial sinew. The total length of the pendant is 4 1/2". It is strung on leather greek thong for extra strength and durability. It has solid French stlye beads and glass black crow beads. The price of this piece is $30.00 (nk00002) click on photo for an enlarged image of the pendant. 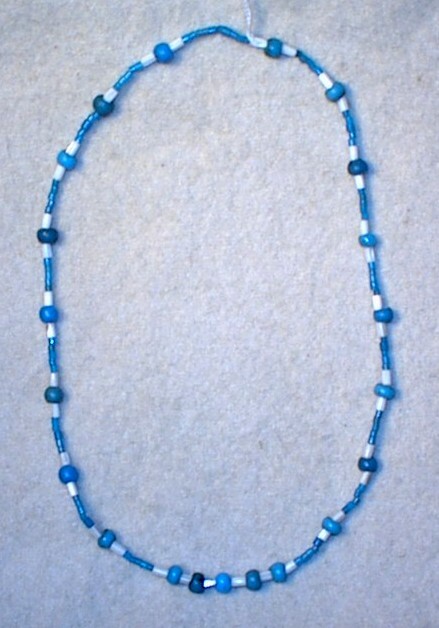 This necklace is made for white and black glass seed beads. The pendant is scrimshawed on a ivory piano key. The design is of a buffalo skull with a nugget of turquoise. The scrimshander is Rich Williams. The price of this necklace $30.00 (nk00003). Click on photo to see enlarged image. This necklace is strung with antique glass melon chevrons beads and round bone beads. The pendant is a small arrowhead of Indiana Hornstone and is mounted onto a 1" bone hairpipe with artificial sinew. The price for this necklace is $30.00 (nk00004) Click on photo for enlarged view.